Northern Cardinal, American Goldfinches, Dark-eyed Junco, and House Finches at a feeder, by Stephen and Judy Shelasky. According to the U.S. 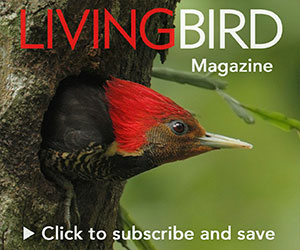 Fish and Wild­life Service, more than 50 million North Americans feed birds. That’s more than 1 million tons of seed, what scientists call supplementary feeding, provided to birds every year. According to the most recent State of North America’s Birds report, one-third of all our continent’s bird species need urgent conservation action. More than 400 birds are on the report’s Watch List of species considered most at risk of extinction. 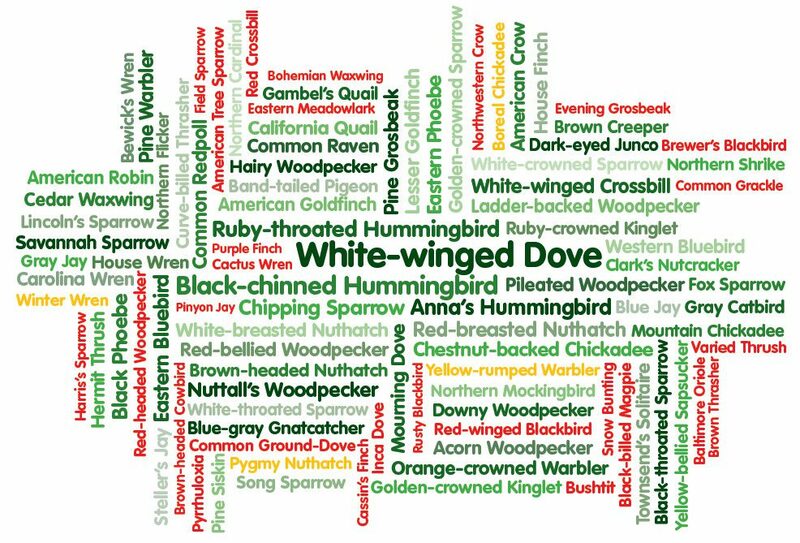 This word cloud portrays population trends from 1966 to 2013 for 98 bird species that use bird feeders at least a moderate amount. Species names in green are increasing in population, yellow have not changed, and red are declining. Larger names are increasing faster than smaller names. The analysis uses Project FeederWatch and Christmas Bird Count data (Soykan et al. 2016. Population trends for North American winter birds based on hierarchical models. Ecosphere 7 (5):e01351). View a larger image. There are some natural questions that emerge from these facts: Is this massive annual experiment in supple­mentary feeding affecting our conti­nent’s bird populations? And if so, is feeding birds harmful, or helpful? There are some clear benefits of feed­ing birds. We know that some regular feeder visitors, such as Northern Cardi­nals, are doing very well, because their populations are growing and ranges expanding. But supplementary feeding has also been associated with negative impacts such as disease transmission, deaths from window strikes (when birds fly away from a feeder and into a house), and increased predation pressures (such as Cooper’s Hawks feeding themselves by feasting on feeder birds). Can we rec­oncile these disparate consequences of bird feeding and determine if feeding is actually harmful on a broad scale? We decided to put the nearly 30 years of Project FeederWatch data to use to try to answer this question. We made one simple prediction: if feeding birds is harmful, then the species that use feeders the most should be doing the worst, all else being equal. FeederWatch data would tell us how often a species used feeders, and Christmas Bird Count data would give us an independent es­timate of how each species was doing over time. We looked at 98 species that use feeders at least a moderate amount and excluded species that rarely visit feeders, because lumping these species would be as logical as comparing chick­adees to herons. We found that species that use bird feeders the most tended to be doing just as well as, or better than, species that use feeders more sporadically. For example, Red-bellied Woodpeckers visit feeders regularly and are thriving, whereas Pinyon Jays visit feeders more sporadically and are showing declines. The feeder species that showed declines seem to be faced with non-feeder–re­lated pressures, such as habitat loss. For Pinyon Jays, the most pressing problem is the destruction of pinyon pine hab­itat. We are still working to refine this analysis, but the take-home message so far is that species that visit bird feeders a lot tend to be doing very well. Bird feeders connect people to their backyard birds—as FeederWatcher Lori Ballard showed with this homemade holiday card photo. Photo by Lori Ballard/PFW. When snow covers the ground, suet cakes are a welcome source of nutrition for Eastern Bluebirds in a Tennessee backyard. Photo by Bob Vuxinic/PFW. Many birds eat suet when they need “energy” food. Here a Red-bellied Woodpecker, Baltimore Oriole, and Rose-breasted Grosbeaks take advantage of feeders in Michigan. Photo by Robert Meier/PFW. A Tufted Titmouse gathers seeds in Indiana. You can get creative with how you serve up a bird buffet, like putting seeds in natural rock crevices and nooks in trees. Photo by Mike Bourdon/PFW. But which are the species in need of urgent conservation action, according to the State of the Birds report? Well, they aren’t visiting your feeders. The species most in trouble are seabirds, shorebirds, and tropical forest dwellers. This means that although feeding birds may not be harmful to the species that use feeders the most, it also isn’t helpful to the species that most need our help. But don’t take down your feeders in despair. One of the most important impacts of feeding birds is that it allows people to feel connected to the natural world. One FeederWatch participant sent out a homemade holiday card with a photograph of a Black-capped Chickadee on a miniature sleigh full of sunflower seeds. The message on the card read: “Feeding the birds is the best present you could give them.” The photograph illustrates the joy that feed­ing birds can bring right to our homes. That joy and connection are not trivial. On the contrary, it can inspire people to engage in environmental advocacy and conservation action to help the many species that need more than sun­flower seeds. We still have a lot to learn about the impacts of feeding birds, such as pos­sible indirect effects on migratory spe­cies, or possible effects on generalist predators that may subsequently im­pact populations of non-feeder birds. Nonetheless, this work is a start, and gives us a new perspective on this tre­mendously popular activity. Is feeding birds the best gift you can give them? Maybe not, but it might be the best gift we can give ourselves. Emma Greig leads Project FeederWatch. This essay summarizes research conducted by Greig and Cornell Lab Citizen Science Director David Bonter and presented at the 2016 North American Ornithological Conference.